It took very little time and convincing to help me decide to dive in....and maybe this will be the perfect project to get me inspired and motivated to sew again. This is the fabric; 100% silk, almost slubless dupioni. The picture turned out way lighter than it is in reality, thanks to the fluorescent garage lights we have that have yet to be replaced. The true color is exactly like the light portions of fabric seen in the portrait (according to my computer screen anyway), however, it does not go nearly enough towards the dark/black side in shadow. I'm guessing the original silk was probably cross threaded black and olive, where this is wove with the same color going both ways. Alas, its likely as close as I can get and not bad for a $5 per yard find. I started with the bodice, using the pattern for the Carpi gown I made earlier this year and altering it slightly. I shaved off about an inch off the neckline side of the shoulder straps, as there is no wide band of trim around this neckline to be accounted for. I'm hoping to get the shoulder straps to recede and 'disappear' properly into the baragoni. I also took almost two inches off the top front of the bodice to account for the daringly low neckline. Its still not as low as in the portrait, but as close as I feel I can comfortably wear. I also shaved a bit off the bottom of the bodice and brought in the center front and center back. The bodice consists of 4-5 layers. In the front; 1) olive silk outer 2) cotton interlining 3) wool for padding 4) another layer of wool 5) black silk/cotton lining. The back and straps consists of the same, minus one layer of wool. This is in keeping with most theories about bodices of the mid-early 1500's being padded with wool, felt or something like cardboard, and not being boned. The wool layers are 'quilted' to the cotton interlining and then sewn in between the lining and outer. I trimmed approximately half an inch of the wool away around the edges to precent so much bulk in the seams when it comes to turning. In the portrait there does appear to be a narrow trim of black around the neckline, and the two most prominant options for what it could be, according to other portraits of the time, is either a narrow black guard, or a slashed 'piping'. 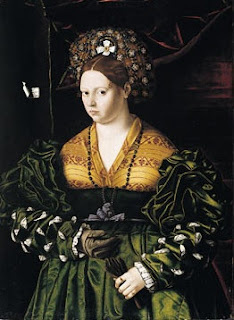 ( http://katerina.purplefiles.net/DOCO/Florence%20styles.html has a good sampling of this ) As I haven't taken the time to find a high res version of the portrait for proof as to what it could be, I decided to go with the piping, as it's something I have not played with much. My biggest previous attempt was on the front edge and collar of the zimmara for IRCC I, and I believe I made the initial strips for the piping too wide, and the end result was 'floppy'. So I tried to make the strips for this piping narrower to begin with, about an inch and a half. I used scraps of very poor, terribly slubby black dupioni ( on clearance at Hancock fabrics, cheap enough that I couldn't pass it up, even in its awfulness). I'm hoping it will hold up OK, and not fall apart, but it was what I had on hand to use, and I am too eager to order something and wait for it to arrive before proceeding. I pressed the strips in half, and snipped about a quarter inch into the folded edge at a slight angle, using my thumb for spacing. I then sewed the piping to the outer and lining layers of the bodice with a normal seam allowance, raw edges together, and turned this inside and topstitched it flat by hand. The lining I then folded under and whipstitched into place. For the most part I think I am happy with how it turned out. There are a few spots, in the corners mostly, that may take some tidying up. The bodice has side back lacings. I hand bound the eyelets, five on each front side and six on each back side. They are spaced to allow for spiral lacing, as seen on the Eleanora burial gown and in various portraits of the time. The blue ribbon will eventually be replaced by lucet cord to match the gown. So far I am very pleased with how the neckline sits, low and wide, without falling off. So far, there are three things I have found that help the most with keeping the straps in place. Firstly, ensuring the shoulder straps (all layers) are cut on a bias to allow for them to 'hug' the shoulders. I also have played with this pattern enough that (unintentionally, over time) my shoulder straps have developed a bit of a an outward 'flare' at the base of the front strap, armscye side, where the strap meets the front of the bodice. This allows for the arm to still move comfortably, without the strap either falling or being restricting. The third thing is to keep the back of the gown high, keeping the base of the back of the straps high and unable to slip. Now when it comes to styles that are low and wide with an obviously low back, I am at a loss. But this is what works for me, and I find it very comfortable. Now I am off to decide how much of the remaining fabric to allot for sleeves and how much will be left for a skirt. I started off with meagre 6 yards of 45 wide fabric. I used maybe one third a yard for the bodice, and will need at least a yard per sleeve, not leaving too much for a skirt, so I'll see what I can weasel out. I can't believe how fast you can get a bodice done. Wow. If you want to try a balzo once you are done with the dress, I'd be happy to help. The outfit is going to be amazing. Thanks Hastings! Help would so amazing!!! After all my failed attempts at Balzos I was unsure of what I was going to try next. That fabric is truly delish. It's going to look fantastic!